Issue #44 of The Future Fire cries out to power, standing and yelling that we have had enough, that there is only so much pressure a person or a community can take before breaking—or before striking back and breaking the system that seeks to keep us down. It also cries out to those who are suffering around us, letting each other know that we are not alone, that we don’t need to be silent and that together we are mighty. That we shouldn’t forget to sing, to let our choirmates know we’re still here. And that if this is an adventure, then it isn’t going to be easy, and if that isn’t what makes it glorious (adversity crushes as often as it makes us stronger), the solidarity of fellow-travelers around us is a glorious thing to see and feel. The stories and poems herein are full of angry voices who have had enough: women who march or sharpen their claws, daughters who refuse to be servants or to meet expectations, citizens who stand up for equality against unscrupulous rulers, who prioritise their own lives over duty. We even have a page of venue reviews that tell us a bit more than the customers realise! All of these stories—the angry, the sweet, the lyrical, the heartbreaking, the funny—take us on a journey, a expedition that requires fortitude and courage, but will reward us with danger and terror, and even honor, if we’re willing to walk the road with our guides and companions. We at TFF have also been walking with monsters the last couple months. We’re about to make a final decision about the contents for the Making Monsters anthology, which is an exciting place to be… seeing all the stories, poems and essays come together, figuring out how they play off one another, picking a running order for the table of contents. And of course we can’t wait for you all to read it—should be on the shelves this coming August. 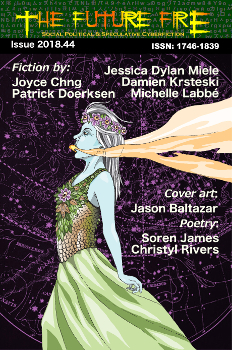 In the meantime, anyway, we’re delighted that this issue welcomes to the TFF family Christyl, Jessica, Michelle, Patrick and Soren with three new stories and two poems, plus a return from Damien with a novelette, and our old friend Joyce’s short story. We also have fabulous and brilliant art from Eric, Jason, Joyce (again), Martin, Miguel, Miranda and our co-editor Valeria, who continue to surprise us by doing what all the best illustrators do—create their own art inspired by the story, rather than simply draw what the author is describing. Thanks so much to all them for the wonderful artistry which is, in every way, what we’re here for. Thank you for joining us for this adventure. Enjoy the ride.